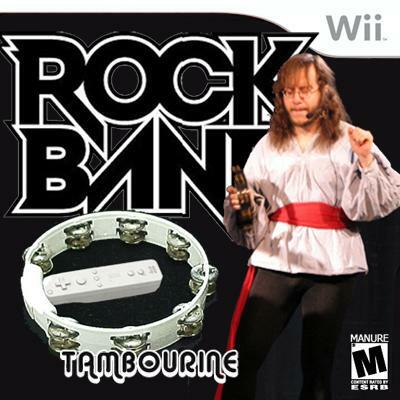 Before DJ Hero hogs all of your attention, I give you the soundtrack to your new favorite time killer: Rock Ban(d) Tambourine! Develop that upper body strength, while having a swell time, playing along to some amazing songs. I read somewhere that the microphone on Rock Band can double for the tambourine, so the singer stays occupied during excessive guitar solos. This is a collection of songs with tambourine. Can't say I didn't warn you. This has been fun to compile. Please to enjoy. It wouldn't be right to omit this one. Welcome to the game. Track 13 from Give It Back! Joel Gion unlocked upon song completion. Choose from a variety of black leater jackets and sunglasses for him to wear. If I was a tambourine player in a band, I'd like to be as cool as Joel seemed to be in Dig! Complete with shaker interval, shaker module not included. Fantastic song. What a voice. Tracy Partridge unlocked upon completion. One of the unsung icons of The Tambourine Hall of Fame. Have you purchased the Rock Band harmonica module, too? Play the bass drum part AND the tambourine on Expert. What a great video. This was an early inductee for the mix. It starts off with a bang, literally. I love this song. This song may be played with the Rock Band Toy Piano module, also. I purchased The Warlocks' The Mirror Explodes, yesterday. This is a gem of modern psychedelia. Smile! Zia McCabe unlocked, fully clothed, upon completion of song. This follows The Warlocks very well. I first heard this played in Bickford Shmeckler's Cool Ideas. It sounds like The Breeders "playing to the crowd" at a mid-nineties prom. Very uptempo and infectious. 15 Cato Salsa Experience : M.F. From one of my favorite modern garage rock bands. And they're from Norway! Another Nugget to conquer. The A Button may be used for the bell/chime parts on Expert. I found this band as a result of hearing their wonderful ELO cover. I really like what I have heard from The Minders. Platinum Edition versions of this game ($500) allow Liela Moss to be unlocked upon completion. One of my new favorite songs. Try and keep up! I imagine a sped-up film montage of kids running around a tire swing outdoors. Very fun song. One of my favorite tracks on the mix, along with "Such Magic Potion." Davy Jones unlocked upon completion. Another Tambourine Hall of Fame member. The longest song of the mix. Do you have the banjo module? Well? Fantastic song. I never tire of this song. "I wont. Let them. Burn this. Mother down." Liam Gallagher unlocked upon completion. Earn bonus points for spiking and/or drop-kicking the tambourine, for a grand finale. Sneer. This made my day. I'm now waiting for "Rock Ban(d): Jazz Flute". Fab mix. Classics like 1, 4, 10, 16 & 22 amongst some lesser known gems 9,19 & 21. And now you've discovered The Minders go buy everything by them. My very favourite contemporary band - love 'em..
Track 14 is a rocker. Cool mix.